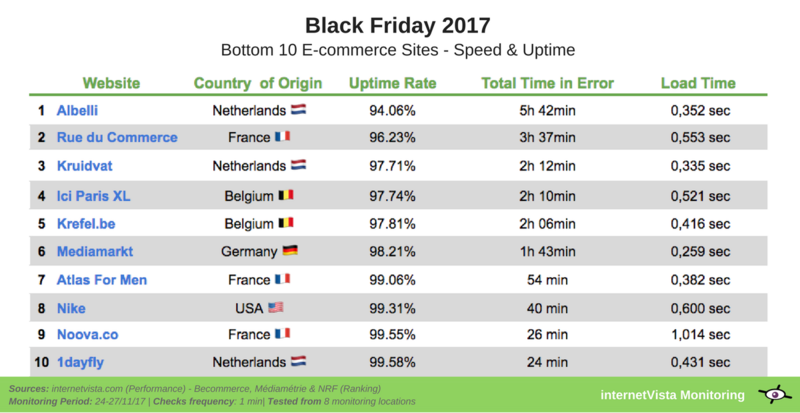 Black Friday 2017: Web Performance Report of 130 E-commerce Sites! 21 hours and 38 minutes ! 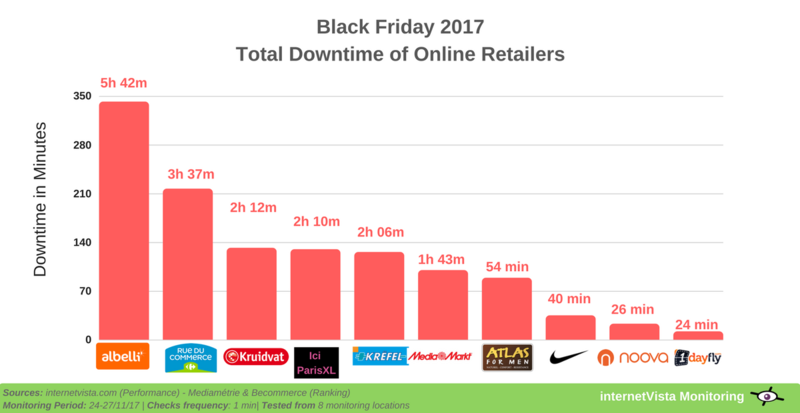 This is the total amount of downtime from the top online retailers on Black Friday 2017. Still not getting it, right? People couldn’t buy from them because their site was down! Not available or accessible, if you prefer. And we’re talking about the biggest players here, like Nike, Rueducommerce or Mediamarkt. If only they’d have followed and applied our monitoring tips, they’d probably have saved a lot of money. 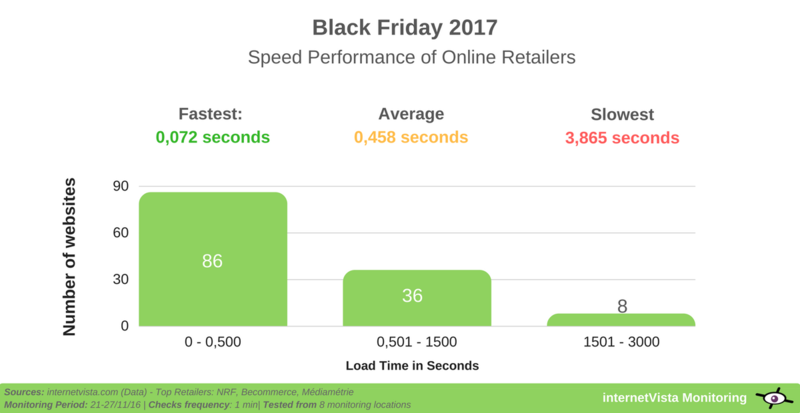 We’ve monitored the web performance of 130 ecommerce sites in total on Black Friday. The report includes the most popular webshops in Belgium, France and USA. 24/100 of Belgian’s webshops went down! Who suffered the most from downtime? How fast are the top online retailers? 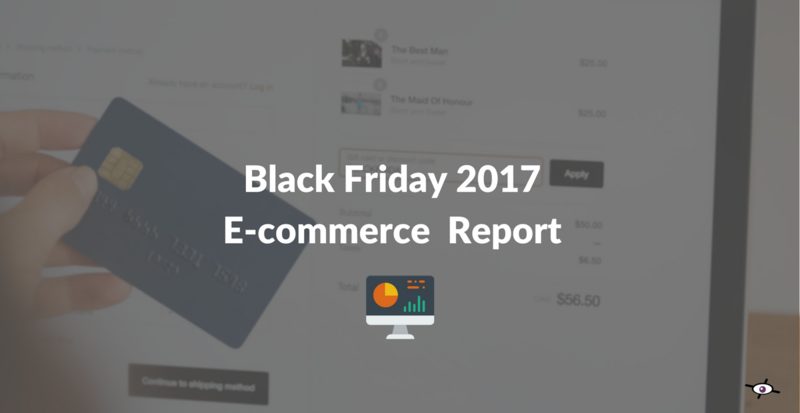 Black Friday is definitely one of the most important event for online retailers but some of them completely missed it. In fact, 10 out of 130 sites monitored faced major breakdowns and counted over than 18 hours of downtime all together! Only 2 out 10 most impacted sites are Belgian. The 8 left are actually cross-border online sellers, including countries such as France, Netherlands or even the USA! How fast are the online retailers? When it comes to selling online, every second counts. All the online retailers lives by a common motto: “Time is money”! Back in the days, it didn’t really matter if a site was slow to load. But nowadays, online shoppers have less and less patience. According to a survey made by Akamai & Gomez, 30% of web consumers expect a page to load in 1 second or less, compared to only 5% expecting 1 second or less in 2009! If we look at the overall speed stats, the majority have passed the test. 86 out of 130 take less than 0,500 seconds to load. 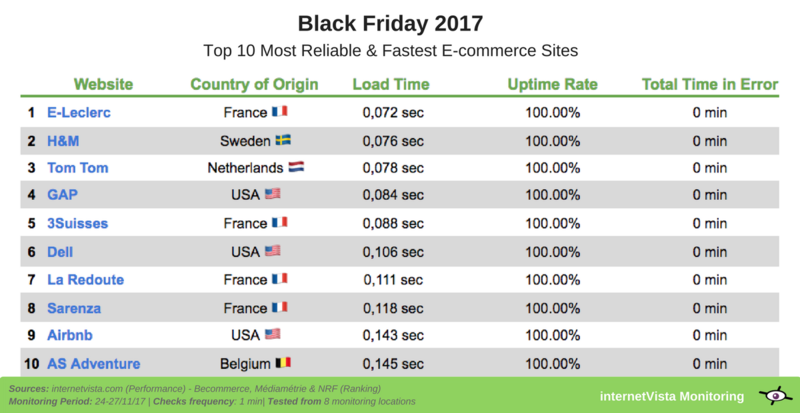 The slowest sites are surprisingly the biggest online retailers like Aliexpress (1,185 second) or Bestbuy (3,865 seconds)! Who suffered the most from downtime ? After analyzing the data, we noticed that it’s the European retailers who faced the biggest outages. Abelli (Netherlands) and Rueducommerce (France) were the ones who struggled the most. With an average uptime rate of 94,05% and 96,23%, they’ve lost together almost 10 hours of online sales! The situation was even worst for the French shopping site. The outage not only stroke the homepage but the checkout process, meaning that no one was able to proceed the orders… and people let them know on Twitter. Moral of the story: Avoid a broken checkout by using a transaction monitoring! The retailer’s payment system had crashed on Black Friday in a few places across the U.S. People were not able to use debit, credit or even gift’s card! The outage started around noon and lasted a few hours before going back to normal. It seemed that the breakdown also affected Macy’s website and its app. The home improvement retailer’s website went down early in the morning. Again, consumers went on Twitter to report the issue. The site went back to normal around 11 a.m. The outage was caused by an unexpected massive web traffic due to Black Friday deals promoted. We’ve noticed an outage at 9 p.m (GMT+1) on 23/11/17, one day prior to Black Friday. 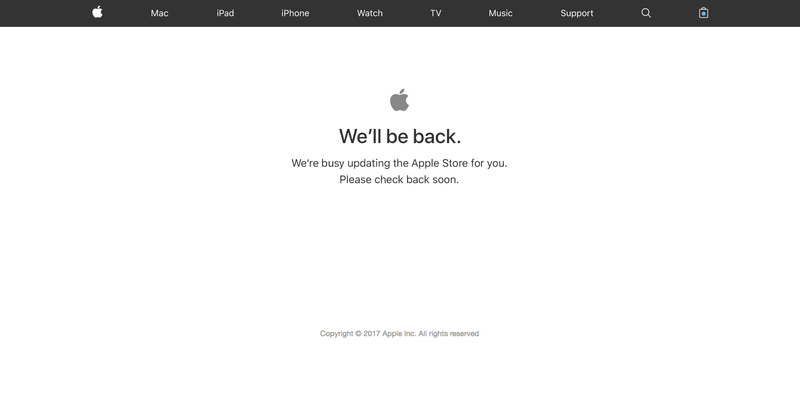 The apple store was down, returning an error message (503 – service unavailable). The site was available again around 1 a.m (GMT+1). While many online retailers would freak out, Apple doesn’t care. In fact, they used downtime as a marketing strategy. If you want to know more, check this short post on linkedIn. 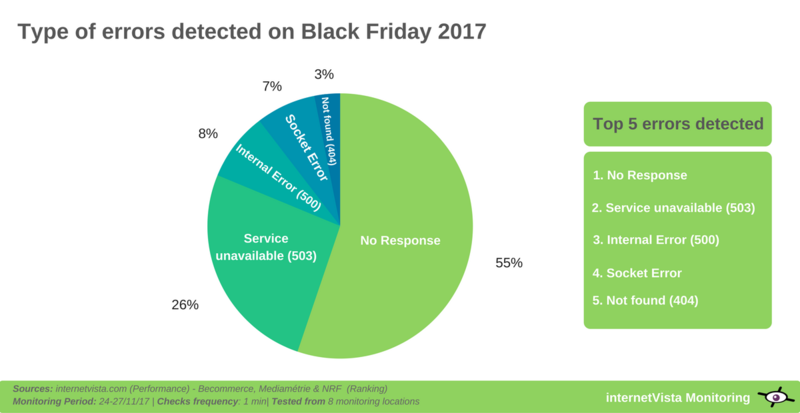 Here below are the top 5 errors detected during black friday on the sites that we’ve monitored. Feel free to check out the complete list of errors when monitoring your website. 💡Discover all the possible error codes when monitoring your site. E-leclerc.com with a an average load time of 0,074 second! In the graphic below, we can notice a huge difference between the fastest and slowest e-commerce sites. For instance Bestbuy.com takes almost 4 seconds to completely loads its website. 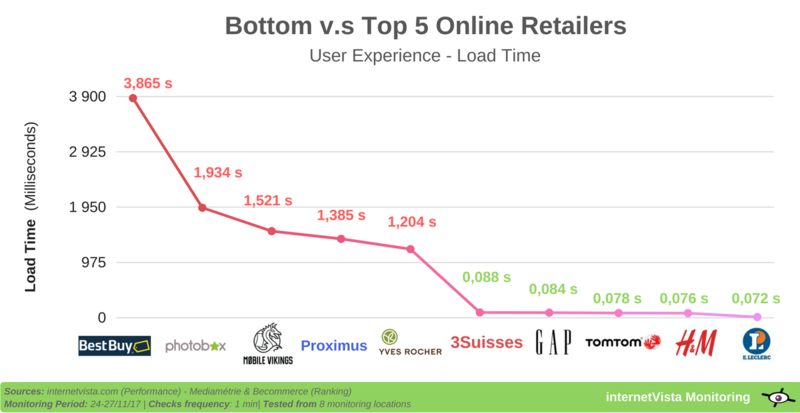 At the opposite, the ranking is pretty tight for the fastest online retailers, which loads under 0,100 seconds! 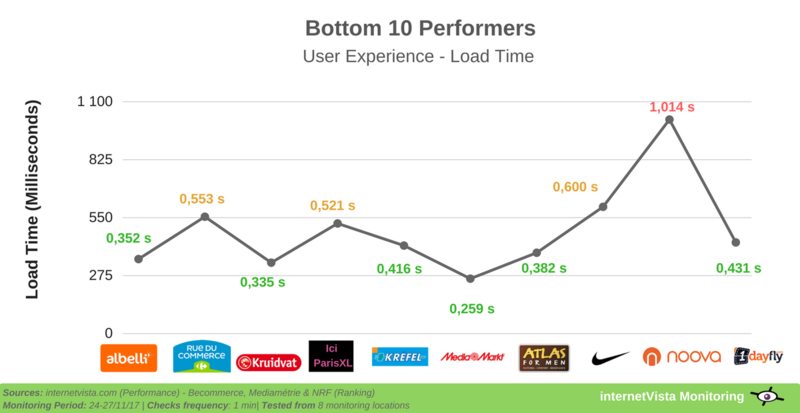 The speed performance is neither that bad for the 10 sites which faced the biggest breakdowns. To check the full report by country, please check this google sheet. We’ve monitored the most visited websites in Belgium, France and USA between 24/11/17 to 27/11/17. Our monitoring checked the homepage every 1 minute from 8 monitoring locations (Amsterdam, Brussels, Dallas, Lausanne, London, Montreal, Munich and Roubaix). The worst nightmare for a retailer is, if its site goes down. 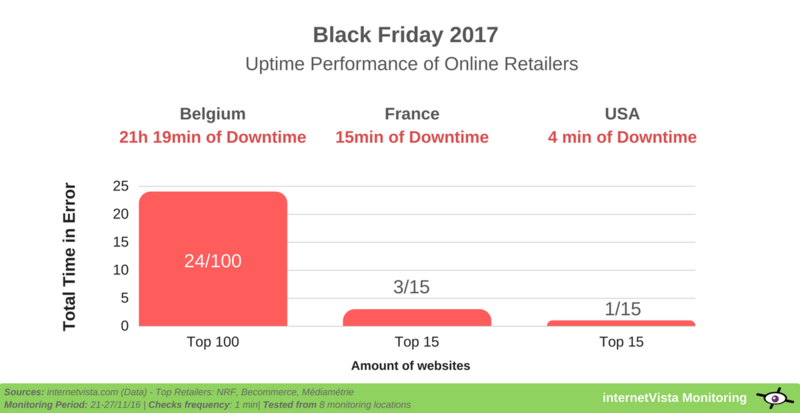 As you’ve seen it through the report, downtime happened on Black Friday this year again. For some of them, it was literally a disaster in terms of sales! Winter is coming… so is Christmas sales! Start monitoring your e-commerce and be alerted as soon as an outage is detected!